When I first moved to Halifax, I was really surprised to see how much love this city has for all things deep-fried and unhealthy. Especially considering how many fine dining restaurants there are in Halifax, and across the whole of Nova Scotia. Admittedly, I moved here from Vancouver, where it was pretty common to find things like edamame and ahi tuna on bar menus, so you could eat healthily while enjoying a drink or two. On bar menus across the city you’ll see dishes like fried clams, loaded potato skins, onion rings, mozzarella sticks, and the much loved local dish of deep-fried pepperoni, which always comes served with sweet honey mustard dipping sauce. It is a universal truth that greasy food goes so much better with beer than healthy food, and although initially I shunned the deep-fried pepperoni, from the second I stole my first piece from somebody else’s basket, I was hooked. It is so sinful, crispy and delicious that you can’t help loving the stuff. Of course you wouldn’t want to order it too often, but every now and again, when you’re a few pints in, there’s nothing better to nibble on. 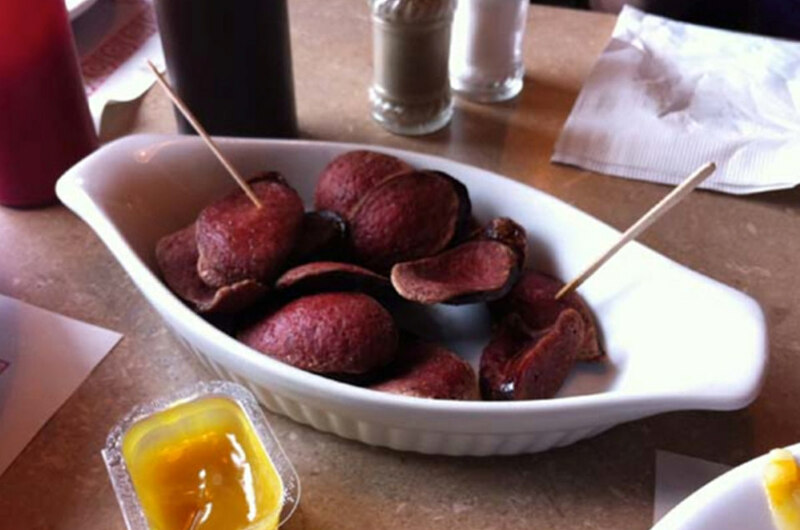 Deep-fried pepperoni is just delicious. While it won’t be listed as a specialty in any restaurant guides, you can get it everywhere in Halifax. I’m sure that 90% of the bars in the city serve it, but it is a sure thing at Maxwell’s Plum on Grafton Street, My Father’s Moustache up on Spring Garden Road, Bearly’s House of Blues and Ribs on Barrington Street and the Lion’s Head up on Robie Street (where Robie crosses Young Street). In most places, the pepperoni served comes from Brother’s Meats, a local smokehouse that has been operating in the city on Agricola Street for more than 50 years. So, if you’re in Halifax, and drinking, you owe it to yourself to order up a basket of this greasy goodness. After all, you have to try the local specialties when you are traveling, right?